I like to try out new things. I like to know if the hype is deserving. I thought that drinking whey protein was hype when it was first suggested to me. So I tried it and I was all "Hey! Muscles! This is awesome!" 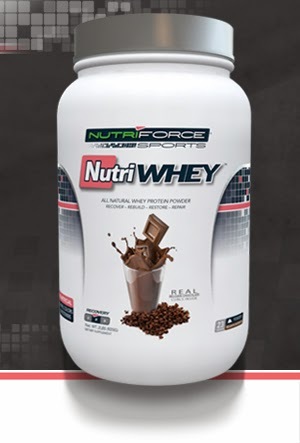 Recently, I had a sample of the NutriForce whey protein with Belgian chocolate curls in it. It was fancy, tasty, and delicious. Kelly is sponsored by NutriForce, and actively uses the stuff so I though I'd give it a try and jumped for a full 5lb tub of it. With in the first few days, I had to begin mixing it with my normal Optimum Nutrition 100% Whey. The NutriForce protein is so sweet, PLUS the chocolate curls, I had to use the Optimum Nutrition protein to soften the impact on my taste buds. After a couple of weeks I found myself so annoyed with the chocolate curls. What was a neat thing at first became an impedance to quickly downing a protein shake. I'd have to strain it through my tongue and teeth, then chew the curls. Finally, a couple weeks more down the road (remember, a 5lb tub is lasting me a long time because I'm mixing it 50:50 with my Optimum Nutrition) I'm switching my diet up and trying to get a higher % of calories from protein. Now I'm dreading the second protein shake and counting down the scoops until I'm done. Does it work? Well, it's protein. So yeah. But better than your standard? Not that I can tell. Thing is, if you don't take it, or don't finish it because it's not tasty enough, it's not going to do you any good. So pay no attention to the images of Annie Thorrisdottir on their banners, marketing won't make you stronger.